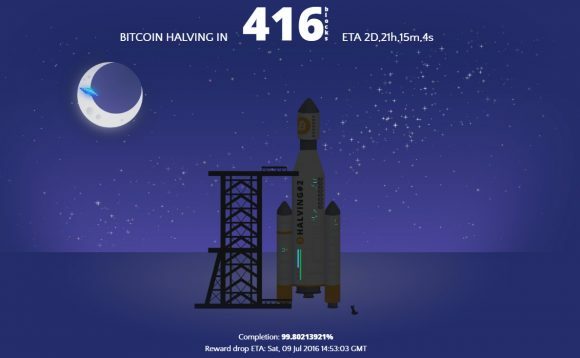 The second Bitcoin block reward halving is going to happen in a bit less than 3 days from now with a little over 400 blocks remaining. The amount of Bitcoins rewarded for each block decreases over time, getting halved once every 210000 blocks (approximately every four years). When Bitcoin was created in 2009, the initial block reward was 50 BTC, then in November 2012, it dropped to 25 BTC after the first halving. As a result of the block reward getting reduced once more in a few days finding a new Bitcoin block will start rewarding the miner that found it with just 12.5 BTC instead of 25 BTC like it is still at the moment. Following this development in 4 more years or sometime in 2020 the next Bitcoin block reward halving is expected to take place further reducing the block reward in half to just 6.25 BTC and so on. This will continue until the total limit of 21 million Bictoins are mined, though this will take quite a lot of years. The total number of BTC after the halving of the block reward should be about 15 Million and 750 Thousands out of the 21 Million total and with the continuing reduction of the reward over time the remaining over 5 Million of coins will take years and years and more halvings to be mined (estimated time is around 2140).